This tutorial shows how to create a renderer for Instant JChem. A renderer controls the formatting of a field type used to display data. For example, a renderer can set the alignment and font of integers, which can be different to the alignment and font of floats. Each renderer is capable of rendering only some type of data and therefore can be use for rendering only certain field types. For each field it is possible to choose a renderer from the list of renderers available for this field type. Before we begin, let's look at the sample that we will build in this tutorial. In the grid view r-click a header of the 'LogP' column and choose 'Customize widget settings'. The table widget settings dialog will open. Instant JChem with the demo project - cell renderers available for 'LogP' columnThe list shows different renderers that are available for rendering 'LogP' column values. One of them is called 'Simple Colouring Renderer'. This is the renderer that we will create in this tutorial. Select 'Simple Colouring Renderer' and you will see its properties. Now that you are familiar with the feature that we are going to create in this tutorial we can dive straight in. In your IDE go to main menu 'File' -> 'New Project...' and create a new 'NetBeans Modules' -> 'Module' project. Call the project 'MyColourRendererPlugin' and don't forget to add it to 'IJC-Extensions' module suite. As the module's 'Code Name Base' enter org.myorg.mycolourrendererplugin and tick the 'Generate XML Layer' checkbox, leave the default location offered for the 'XML Layer' file. 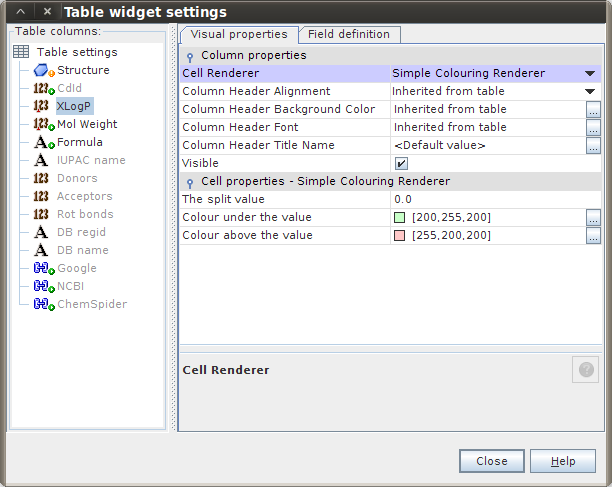 In 'Projects' explorer r-click the 'MyColourRendererPlugin' project's node and in the popup menu choose 'Properties'. The 'Project Properties' dialog will appear. 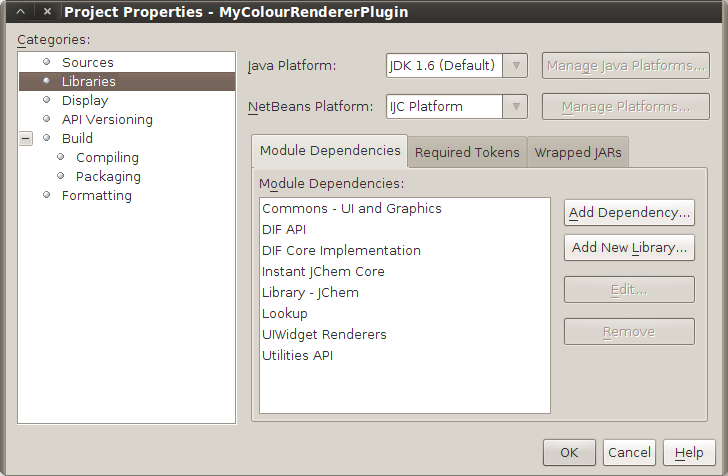 In the 'Project Properties' dialog go to 'Libraries' -> 'Module Dependencies' and click 'Add Dependency...' button to specify modules that 'MyColourRendererPlugin' module will use. In the 'Add Module Dependency' dialog choose the following modules: Commons - UI and Graphics, DIF API, DIF Core Implementation, Instant JChem Core, Library - JChem, Lookup, UIWidget Renderers, Utilities API. 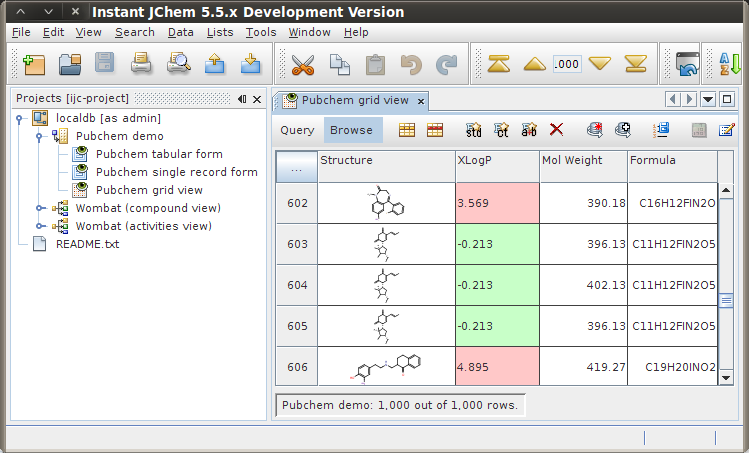 Provides the basic user interface for Instant JChem and through its API it provides the ability to extend the IJC user interface. First, let's begin by creating an implementation of RendererFactory. This interface creates a renderer, depending on the level of suitability of the renderer for the field. Suitability is determined by theRendererFactory.getSuitabilityFor() method. The suitability level is an int between 0 (not supported) and 100 (best renderer for the given field). Below, if the field is an integer or a float, the suitability of the renderer is set to 30. As a result, it will most likely not be the default renderer, because other renderers are likely to have higher suitability levels. 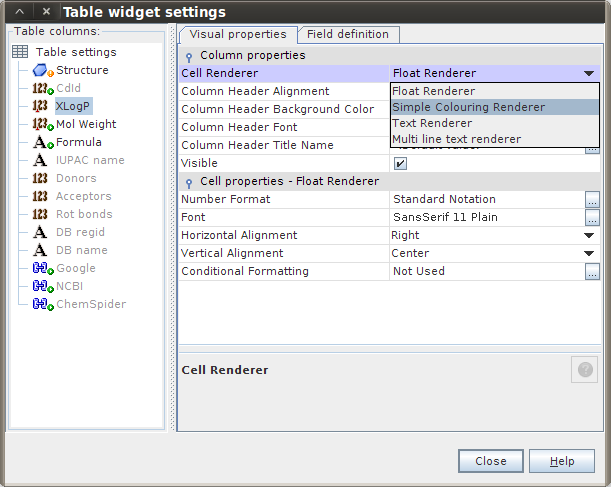 Of the three types of widgets available, we will make our renderer applicable to table cells and IJC widget texts. In the main package, org.myorg.mycolourrendererplugin, create a Java class called ColouringRendererFactory. Add the following to the layer.xml file. These entries create a new folder called IJC, with a subfolder called RendererFactories. Within that folder, we register our implementation of the RendererFactoryinterface. 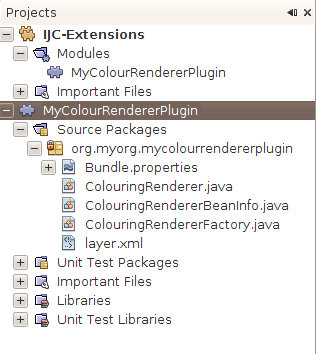 Again, create a java class called ColouringRenderer in the main package org.myorg.mycolourrendererplugin. Go back to ColouringRendererFactory class that you created earlier and change the body of createTableCellRenderer() and createWidgetTextRenderer() methods. Return a new instance ofColouringRenderer class as shown below. Code snippet - ColouringRendererFactory class, createTableCellRenderer() and createWidgetTextRenderer() methods. Let's create the bean info class. Next, create a new java class called ColouringRendererBeanInfo. The new persistence folder that you need to add, as shown above, contains registration entries for writer-factories and reader-factories that store or read UI object settings. When a JavaBean is to be written, Instant JChem looks up a writer (persister), using the class name (obj.getClass().getName()) to write the state to XML format. If such a persister is not registered, the persister for the superclass is tried, etc. A Beaninfo-based Persister is registered for java.lang.Object, so each Object is ultimately written, but the object's class name is stored in the XML file, and all such objects create the element <ijc:simpleBean>in the XML. Therefore, if possible, you should register the persister for a class, in order to get a nice XML element with a tag composed of "namespace":"localName", which looks better. But, mainly, the reason you need to do this is to give Java Class names (which are implementation details that may change from release to release) "abstract" XML element names. You are free to change the implementation classes, provided that a Persister is registered to the element xmlns:localName in a future Instant JChem releases and assuming you will still be able to read old data. For writing Beans, the Persister must be registered as follows: /persistence/classes/class-name-with-dots-replaced-by-underscores. For reading Beans, the Persister must be registered as follows: /persistence/xmlns/namespace-with-nonalphanum-replaced-by-underscores/localname-with-replaced-nonalphanum. You are recommended to register these using .instance DataObjects (using the .instance extension and instanceCreate and class attributes), since this is what is directly supported by the NetBeans platform. If you've followed this tutorial closely you should now have all files in your 'MyColourRendererPlugin' project ready. The project in NetBeans IDE's 'Projects' explorer should look like the picture below. You can now r-click the project's node and build the project by choosing 'Clean and Build' and then run it by invoking 'Run' from the same popup menu. 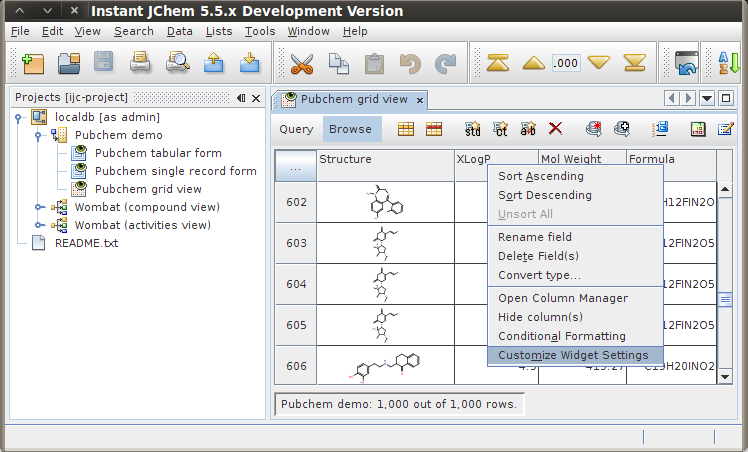 Instant JChem will start with MyColourRendererPlugin installed and the renderer that we have created will be available in the table widget settings customizer. How to implement a renderer and register it in layer.xml. How to create a beaninfo for the renderer implementation class. How to persist objects to XML.